Mega Sale! Save 21% on the In-Ground Permanent Discatcher by Unknown at Scruffs Game. MPN: MDCI. Hurry! Limited time offer. Offer valid only while supplies last. Your choice of either portable with base or in-ground. All galvanized steel construction, HD welds that are hot dipped galvanized after assembly. Your choice of either portable with base or in-ground. All galvanized steel construction, HD welds that are hot dipped galvanized after assembly. 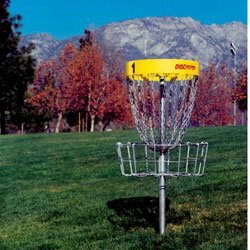 Chain assembly has a larger sweet spot with 24 single chain design, high visibility yellow powder coated stainless steel chain rack, number on both front and back and no sharp plate to gouge high putts. Basket is hot dipped galvanized and powder coated with sloping bottom for added strength and catching capacity and anti-skip basket rim prevents skips.